The Perfect Fall Poncho has an easy construction – two rectangles seamed together with a hole left for the head in the middle. Can’t get easier than that! But the stitches used to create the cable look are unique – so here’s a video tutorial for the Perfect Fall Poncho! This gets repeated 4 times, bringing you to 42 rows. Then you repeat the first 4 rows of the 10 row repeat again (2 post stitch rows, and 2 dc rows), and the first rectangle is done! Repeat the whole thing for a second rectangle, and then sew the last row of the first rectangle to the first row of the second rectangle, leaving a hole in the middle that your head fits through – but not your shoulders! – and work a round of sc all the way around the outside for the edging. The step be step are instructions are of course included on the Perfect Fall Poncho free pattern page, but this is the overview – and the videos above cover the tricky stitches! 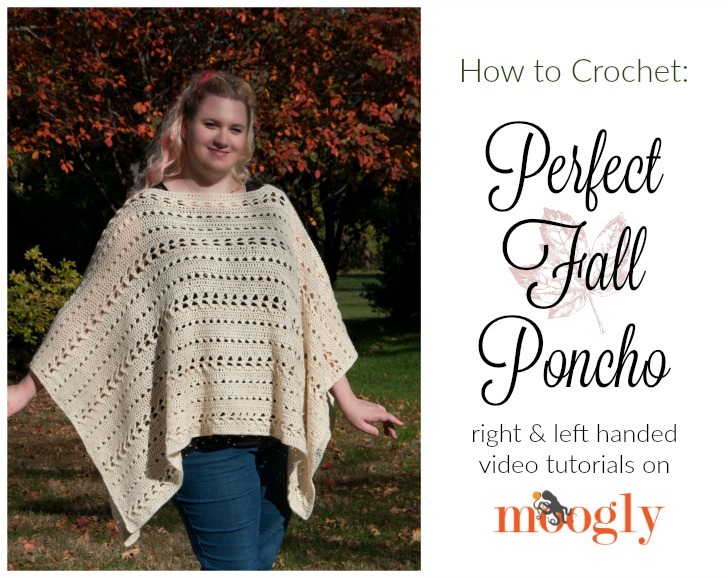 I hope this video tutorial helps you crochet your own Perfect Fall Poncho! Thanks so much for watching! Get Moogly on your favorite social media sites: Facebook, Twitter, G+, Pinterest, Instagram and Tumblr, and sign up for the free Newsletter so you don’t miss a thing! Thank you to Lion Brand and Furls Fiberarts for providing the materials for this tutorial. Thanks for sharing! I cannot wait to try this! 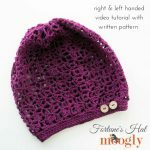 You create the most wonderful patterns and I really appreciate the video tutorials on the more difficult parts. This is gorgeous. I cant wait to get started. I have gift cards and I am going to buy yarn tomorrow. I only have one problem how can I print this without all the ads. Thank you Lagretta! To print, click the green Print Friendly button at the bottom of the pattern. If you are on mobile and don’t see it, try going to the desktop version of the site. Thank you so much! Your reply was right on time. I went to the store today. All regular price yarn was 30% off. I’m starting now. Ooo lucky day! 😀 Thanks LaGretta! I am having a terrible time keeping my edge straight. I either have an extra stitch or short 1 stitch. I have frogged at least 3 times. Do you dc in the same stitch as the beginning chain and dc in turning chain at the end of the row? Hello LaGretta! You dc in the first st, but not in the turning chain. So, I crochet in the stitch next to the turning chain and do not crochet in the same stitch as the turning chain? Sorry for asking . I just want to be clear. You crochet in each stitch, but not in the turning chain itself. Tamara! Wow! You ‘re tutorials are so comprehensive! Of the best I’ve seen, yet! This is gorgeous and I cannot wait to get started! Thank you so very much! I am about to subscribe for more! 😀 Thank you so much Diane!! Crazy question. I’m not a super experienced crocheter. 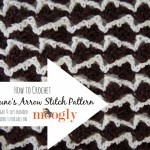 I’m loving this pattern though! & the video tutorial is SO helpful! Anyway, I’m about 1/3 of the way through the first panel and a bit of a disaster struck. I took it with me yesterday and on the way home, the dog threw up on my bag & it soaked through and is now all over my work and the rest of my skein of yarn! SO GROSS! Any idea how I can wash it, since it’s not finished? Oh no! I’m so sorry to hear it, Keira! Okay, if you can handle it… I would cut the yarn and finish off (just tie the usual knot where you are in the project). Then washing the already crocheted yarn is (relatively) easy. For the rest of the unworked yarn, I would soak it repeatedly in cool water, draining the water each time. It might not be salvageable, but at least you should be able to keep what you’ve already crocheted, and just start a new skein on it. I’ll try it. Thanks so much! Hi I am ready to connect pieces together. When you sat sew do you mean with a machine? love your pattern. so easy thank you so much.